The Indian Science Congress Association BBSR Chapter in association with KIIT- DU & KISS-DU is organizing two daysNational Seminar on “Future India: Science & Technology“on 1st & 2nd February, 2019. The Inaugural Function was held at Campus-7 Auditorium on 1st February, 2019. At the outset, Dr. Kajal Parashar, Convener of ISCA Bhubaneswar Chapter & Organizing Secretary placed the Welcome Address. She said that ISCA Bhubaneswar Chapter is continuously involving itself in propagation of Science and trying to fulfill the objectives of Indian Science Congress Association. 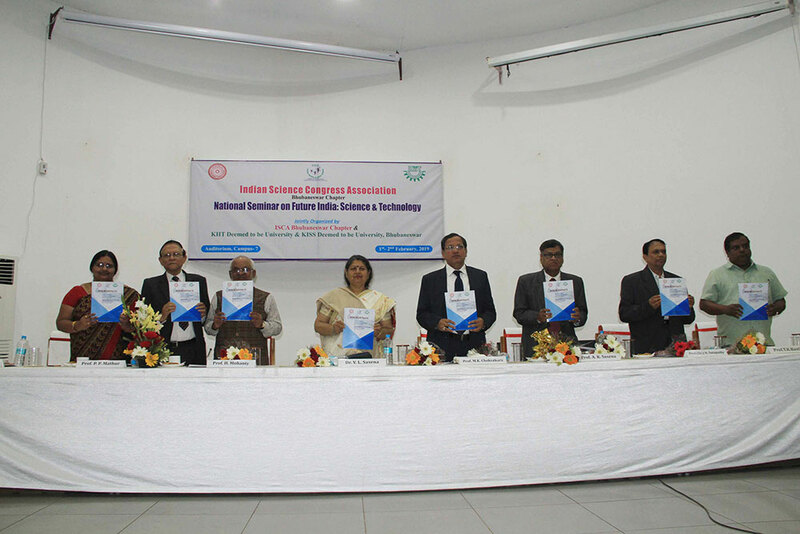 Gracing the occasion as Chief Guest, Dr. Vijaylaxmi Saxena, General President(Elect), ISCA said that Science and Technology have strong presence felt everywhere and make lives simpler day by day. While this manifesto of scientific achievements reach the people easily, meanwhile, we have accomplished many milestones. Today India have joined in the league of top six advanced nations of the world in the field of Space Technology. “In the field of agriculture, our scientific and technological researches empowered us to become self reliant and self sufficient in food production. Similarly, in the field of Industrial and Scientific Research, we have accomplished many milestones and India is evolving as a major industrial power in the world. Today’s progress in the field of Science and Technology shows that future of India is shining,” added Dr. Saxena. In his Address, Prof. Harekrishna Satapathy, VC, KISS DU said that, after Independence, we have seen tremendous progress because of the contributions of our Scientists. In all, we have experienced mainly eight revolutions. First of all, we had Green Revolution under the leadership of Great Scientist M.S. Swaminathan. Later on, White Revolution, Health Revolution and Space Revolution(under the direction of A.P.J. Abdul Kalam) were emerged. In course of time, we came across Energy Revolution, Cyber Revolution(led by Narayan Murthy), Revolution in Manufacturing and Infrastructure Development and last but not the least Environmental Revolution. “While launching the great revolutions and making these a grand success, India has made tremendous progress in the domain of Science and Technology. Medication & Meditation should go hand in hand. 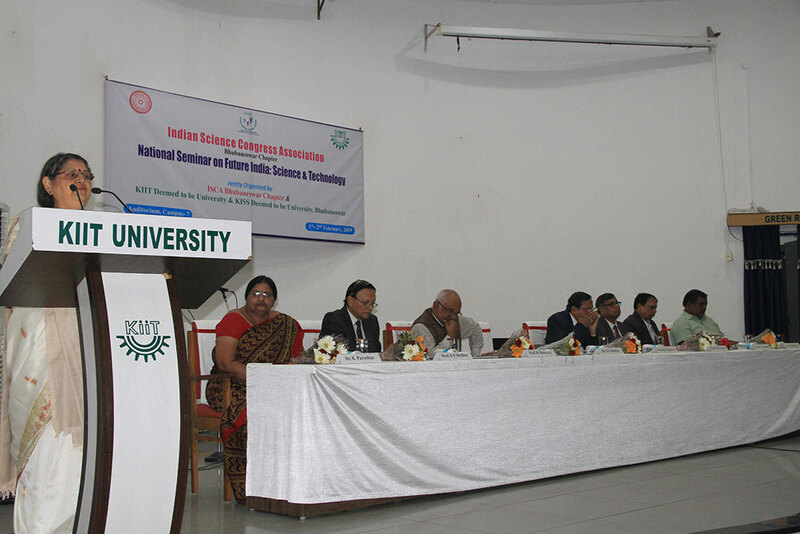 Let’s fine-tune our Research Methodology, so that we can have an impact in the entire country,” added Prof. Satapathy. Placing the Presidential Speech, Dr. M. K. Chakrabarty, General President of ISCA said that lifestyle based non communicable diseases are going to be a very big problem for our country in near future due to climate change and environmental pollution. Today the number of people below poverty line coincide with that of the total population of India at the time of Independence. That’s why, we have to increase food production by 2030. He further said that, the latest Science Policy was declared in 2013 and it had completely focused on Science, Technology and Innovation. The period from 2010 to 2020 is the decade of innovation. Without innovation, a country can’ be rich and accumulate a lots of wealth. However, innovation should be commercialized to achieve great heights. Among the dignitaries, Dr. Hrushikesha Mohanty, VC, KIIT DU; Prof. P.P. Mathur, General Secretary, Scientific Activities, ISCA and Prof. A.K. Saxena, Former President of ISCA were present on the dais and placed their deliberations on the theme of the Seminar. Eventually, Dr. T.K. Bastia, Professor, School of Applied Sciences, KIIT DU proposed Vote of Thanks.